Is Coffee Good for Acne, Oily Skin, or Anti-Aging? Most of us wouldn't dream of starting our day without a hot cup of coffee. The benefits of coffee go beyond your morning pick-me-up. It may have surprising benefits for your skin. Let's take a look at what the science says and what coffee can, and can't, do for your skin. Antioxidants help protect your skin from free radical damage, and coffee just happens to be packed with antioxidants. This is good news for your skin, as antioxidants help fight aging. Some studies have shown that coffee (specifically coffee oil) has similar effects on the skin as the anti-aging skin care ingredient hyaluronic acid. Coffee seed oil can increase collagen and elastin, making the skin look and feel firmer. Coffee can also help keep the skin hydrated by reducing trans epidermal water loss, (a fancy way of saying the way moisture evaporates from the skin). And these qualities aren't just coming from the roasted bean. Extracts made from coffee silverskin (a solid by-product of roasting coffee beans) were shown to have antifungal and antimicrobial qualities, in addition to being a good source of antioxidants. OK, so you probably don't have a supply of coffee silverskin just sitting in your kitchen. But you probably have coffee grounds left over from your morning pot. 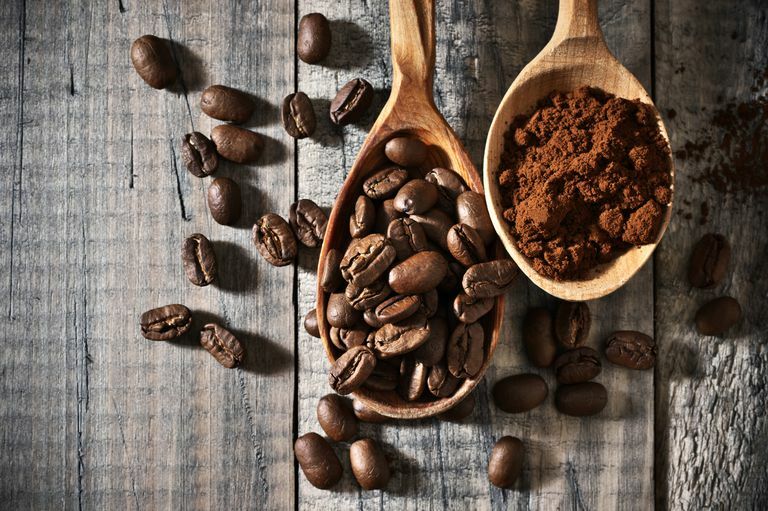 Spent coffee grounds may also have skin care benefits. Several studies have shown spent coffee ground extract helps protect the skin against damage from UV-B rays. So, when included in skin care preparations, coffee extract may help protect your skin against wrinkle formation and sun damage. Interestingly, drinking coffee may also help protect the skin from the sun. Coffee-drinkers are less likely to develop skin cancer, especially melanoma. This isn't a substitute for sunscreen, though. You'll still need to use sunscreen to protect yourself from sunburn and the aging effects of the sun. This is especially true if you're using medications that cause sun sensitivity. Will the coffee grounds left over from your morning cup of java give you the same results as coffee extract? Probably not. Coffee extract is much more potent than what's left behind in your filter. But those spent grounds can be used in DIY treatments and can have benefits for your skin. Obviously, the grounds can be incorporated into handmade scrubs to help exfoliate, smooth, and soften the skin naturally. It's especially good for rough, dry places like elbows, knees, and feet. The caffeine in coffee grounds can also improve the look of the skin, albeit temporarily. Caffeine constricts the skin, making it look firmer and tighter (again, temporary). This tightening effect can help fight puffy eyes, and can make cellulite look less obvious in the short-term. Hang on, coffee lovers. It may smell amazing and leave your skin super soft, but—contrary to what a plethora of online videos say—coffee is definitely not going to clear up your acne. Scrubs, even all-natural ones, won't clear acne themselves. You see, while scrubs can remove the surface layer of dead skin, they don't penetrate the skin's pore. And it's inside the pore where acne blemishes start. Acne isn't caused by oil or dirt on the skin's surface. Instead, it's a blockage deeper inside the pore (technically called the pilosebaceous unit). This, along with a proliferation of acne-causing bacteria and inflammation, causes those pimples we all know and hate. Scrubbing, no matter how often, won't eliminate those factors that cause acne. What's more, a coffee grounds scrub can be quite aggressive and can irritate those already inflamed breakouts. Truly, the best choice for clearing acne are proven over-the-counter products (if your breakouts are mild) or prescription topical acne treatments or oral medications (for moderate to severe acne). They may not be DIY or trendy, but they work, and you'll be happier with the end results. For a fast and fun DIY treatment to smooth and soften your skin, don't toss those spent coffee grounds. Whip up some of these recipes instead. Be careful if you have sensitive skin, though. Coffee grounds can be fairly harsh on delicate skin, so you may want to skip the DIY coffee ground scrub if your skin is sensitive. And, no matter your skin type, don't scrub too aggressively with the coffee treatment. You definitely don't want to irritate your skin. Redness, stinging, and sensitivity are all signs that you're overdoing the scrub. These treatments should be made fresh each time, and discard any leftovers. It goes without saying, but make sure your grounds are cool enough to handle so you don't burn yourself. Mix 1/4 teaspoon spent coffee grounds (finely ground) with 1 tablespoon of another breakfast staple, yogurt. The yogurt flavor isn't particularly important, but plain or vanilla works especially nice with the natural coffee scent. Gently massage over your face and neck and let set five minutes. Rinse well with warm water to reveal bright, soft skin. Use it no more than once or twice per week. Mix 1/2 cup granulated sugar (white or brown), 2 tablespoons spent coffee grounds, and 1/4 cup sweet almond oil. In the shower, massage over your entire body. Pay attention to those rough and dry areas like elbows and knees. Rinse well. Doesn't your skin feel silky smooth? The oils in this recipe can make your shower floor or tub slippery, so please take care. Feet need a little extra TLC, and can handle a more aggressive scrubbing than other areas of the body. Try mixing 1/4 cup each of spent coffee grounds, Dead Sea salt or Epsom salts and olive oil. Use this as a scrub to give your feet a nice treat. Dry lips? Mix a small amount of spent coffee grounds with a dab coconut oil. Massage the mixture lightly over the lips and remove with a damp washcloth. A teaspoon of spent grounds in a dampened paper towel and laid over the eyes for 20 minutes or so will help reduce puffiness. Coffee does have some benefits for the skin. But most of the research done has been on more potent coffee components like coffee oil and coffee extract. Using a DIY scrub with spent coffee grounds, while a fun DIY skin care product, won't give you the same results. Cosmeceuticals containing coffee extract or coffee oil are a better choice if you're looking for skin care benefits. Remember, though, that coffee isn't the only (or even necessarily the best) skin care ingredient for you. There are many other effective options for anti-aging that you can find over the counter: lactic acid, glycolic acid, retinol, and hyaluronic acid are all good examples. Whichever skin care product you use, they do take time to work and they only work for cosmetic issues. If you need guidance, your dermatologist is a good resource. Choi HS, Park ED, Park Y, Han SH, Hong KB, Suh HJ. "Topical Application of Spent Coffee Ground Extracts Protects Skin from Ultraviolet B-induced Photoaging in Hairless Mice." Photochemical and Photobiological Sciences. 2016 Jun; 15(6):779-90. Iriondo-DeHond A, Martorell P, Genovés S, Ramón D, Stamatakis K, Fresno M, Molina A, Del Castillo MD. "Coffee Silverskin Extract Protects against Accelerated Aging Caused by Oxidative Agents." Molecules. 2016 Jun 1;21(6). Rodrigues F, Palmeira-d-Oliveira A, das Neves J, Sarmento B, Amaral MH, Oliveira MB. "Coffee Silverskin: A Possible Valuable Cosmetic Ingredient." Pharmaceutical Biology. 2015 Mar; 53(3):386-94. Wagemaker TA, Rijo P, Rodrigues LM, Maia Campos PM, Fernandes AS, Rosad C. "Integrated Approach in the Assessement of Skin Compatibility of Cosmetic Formulations with Green Coffee Oil." International Journal of Cosmetic Science. 2015 Oct;37(5):506-10.